When I began this blog I had the overblown aspiration that I would do a Book Review post every week. I don’t have enough online laughter for that idea at this point (heck, I haven’t even been able to maintain Science Friday this school year). Despite my lack of time to read for myself, I have had increasing opportunity to read with my children. Which is awesome. I grew up in a home where reading was a priority. Hello English teacher mother! I wanted to carry this trait into my own home. If you read any Freakonomics back in the day, you know that according to Stephen Dubner and Steven Levitt (link to USA Today article, and Marketplace article ) there is NO SHOWN correlation between reading to your children and raising standardized test scores. (However there is a correlation in student test scores and HOW MANY books they have in their homes. Go figure.) In fact, they purportedly found that it is not HOW you parent, but WHO you are as a parent that counts. For my part, I press on in reading to my children (fruitlessly, in terms of economic utility:). I DO believe that it builds brain cells and lifelong connections to understanding information and educational processes. Our school system has also helped to solidify our reading resolve. My oldest is required to read 20-30 minutes each evening. While there are many nights we’ve read more than the required minutes, the accountability of reading charts has kept us on a track and geared to consistent, everyday reading patterns. Along these lines we are ALWAYS looking for new reading material. I posted some of our favorite reads this summer here. But the search perpetually continues. I recently picked up El Deafo from my oldest son’s school Book Fair. I could not be more surprised, enthusiastic, overjoyed, and excited to share this wonderful book with all of you! 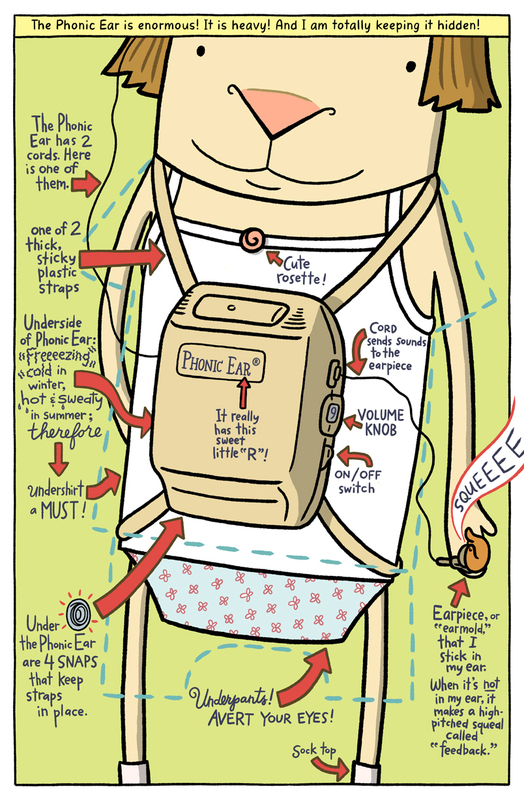 Purchasing El Deafo was a complete FLUKE. Other than the fact that it was a Newburry Honor Book, I didn’t have any inkling how WONDERFUL this book would be for my children and for ME! I LOVED IT! 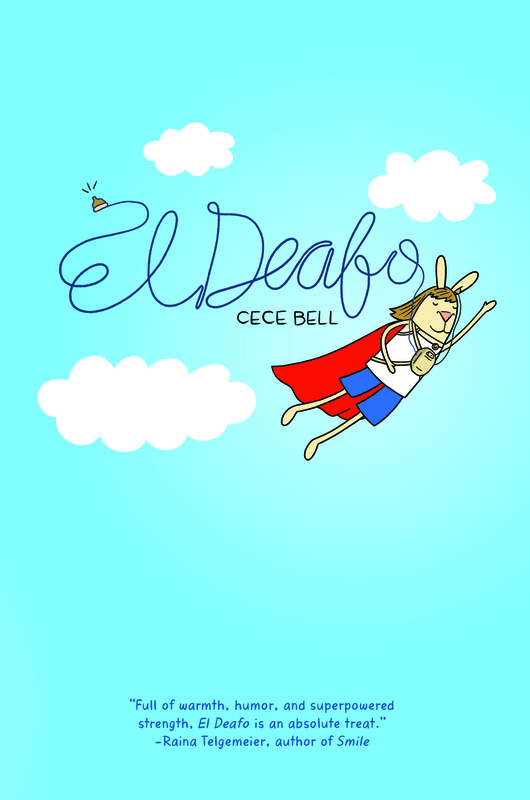 El Deafo follows the life of Cece Bell. A little girl who becomes deaf (partially so, you’ll learn more about her harrowing illness in the text) at age four. Cece attends an all deaf school in Kindergarten where she is in a classroom of all deaf students her age. Here she is taught to lip read, a pivotal skill in her real world arsenal of integrative tools. Very quickly Cece’s is given the opportunity to use her lip reading skills when she is placed in a normative school class in First Grade. For various reasons (read the book, and you’ll know!) Cece creates an alter ego name El Deafo!!! El Deafo, Cece’s super hero persona, allows Cece’s internal-counciousness safety and respite from a world that is often full of misunderstanding and misjudgment for people with disability. For example, Cece doesn’t need her teachers or friends to talk more LOUDLY or more slowly on her behalf. She simply needs them to look her full in the face so that she can read their lips properly. In fact, speaking more loudly and slowly often inhibits Cece’s ability to understand the speaker. It would never have crossed my mind that speaking slowly and loudly to someone hard of hearing might actually be MORE difficult before reading El Deafo. However, that is also not to say that Cece’s needs are the same needs that others with disabilities need or will struggle with. For example, Cece’s mother takes her to an American Sigh Language class. But instead of feeling served, further integrated into the classroom, or excited to be able to use Sign as an avenue of further communication from others, Cece feels as though learning ASL only causes further distance between herself and her peers. She feels as thought the class members are signing AT her not TO her. They are using her to increase their Signing skills, but don’t care to actually KNOW who Cece is, or what SHE truly cares about. The key statement Bell makes is that while disability may make that particular human DIFFERENT, unique, or misunderstood, disability doesn’t but it doesn’t make them not human or un-human. Cece’s desire to be “normal” is very real. Her desire for her friends, family, classmates, teachers, and neighbors is to treat her in the same manner as her peers is VERY strong. This diagram of Cece’s phonic ears helps us to understand some of the difficulties she faces when it comes to being different, but wanting to be included and normal. Hilarious, right?!? I loved this book because of it’s humor. I cannot tell you how many times I laughed out loud. I cannot tell you how many times I said, “Oooooh!” For me that “OOooh.” Was a breakthrough in my understanding into the nuances, needs, desires, and alternative world that those with disabilities live in and face every day. Cece Bell has connectively, communicatively, compassionately created a BEAUTIFUL BRIDGE between the world of disability (no matter how different and INDIVIDUAL those needs and mechanics are for each person) and the world of the normal. She explains the reality of the loneliness her disability brought her. She details the friends who POPPED her bubble of loneliness and made her hearing aids and phonic ear a NON-issue in their friendship. She explains her desires to be the same as everyone else, while also celebrating her Super Human Abilities to understand and even fight disability head on through the character of El Deafo. The truth of the matter is that children with disabilities may have different needs than other children. They may have specific tools, like hearing aids, which are necessary to cope and integrate in the world around them. But they are also looking for those basic human desires– love, inclusion, compassion, acceptance, friendship. I saw this book as a beautiful way to teach my boys about the need for love, care, inclusion, empathy, and always seeking further understanding for children and adults with disabilities. Thank you for building this bridge, Cece Bell! Run out and grab a copy of this beautiful book for YOURSELF today!